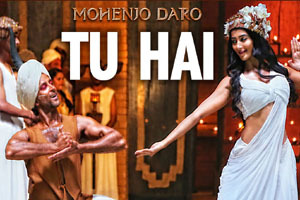 Hindi Lyrics 4 U: Lyrics Of "Tu Hai Mera Yeh Sansar Saara" From Latest Movie - Mohenjo Daro (2016). Beautiful love song in the voice of Sanah Moidutty and A R Rahman featuring Hrithik Roshan, Pooja Hegde. Lyrics of "Tu Hai Mera Yeh Sansar Saara"
Lyrics in Hindi (Unicode) of "तू हैं मेरा ये संसार सारा"